C20131102-eng-aus-obstruction identifies a controversy when England played Australia in November 2013. England bagged a try but was it fair. The ref and TMO said yes. I disagree. What do you say? 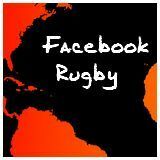 In the initial footage of the try being scored viewers saw Farrell from the side, slicing through a mass of players. Brilliant!! Or was it? It looked good from side-on, but what really happened? The referee (George Clancy) then consulted the TMO, saying 'I just want to check for an obstruction'. 'Check for obstruction, okay', the TMO (Marshall Kilgore) replied. While the TMO was making his decision viewers were given views from different angles. The following images come from that footage. Image credits: Screen grabs from Channel 10 television coverage. In the image below England fly-half Owen Farrell is about to catch the ball and become the player carrying the ball. In the image below Farrell has caught the ball, becoming the ball carrier. Law 10 covers the situation. It says that any player in front of the ball carrier is offside and liable to be penalised if they 'interfere with play'. What does this mean? Law 10.1(a,b,c) tells us the player must not play the ball or or prevent the opposition from playing as they wish. 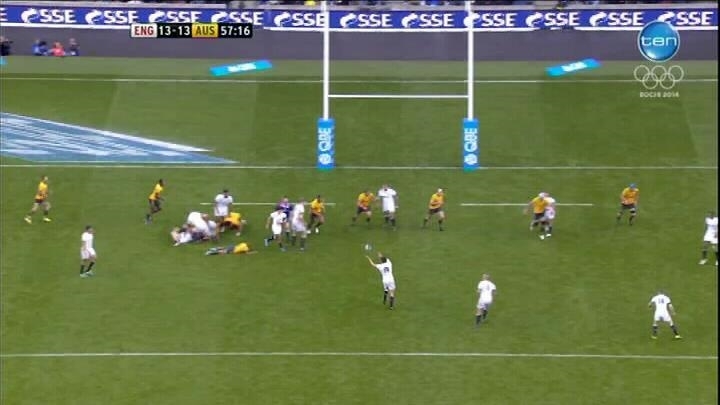 During footage that finishes with the image below, the commentator says of Farrell - 'He's on the blindside. He's coming late. The Australians don't see him coming'. Don't see him coming?! There's a solid line of 5 Australian players in front of him! 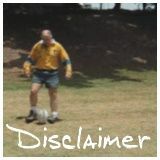 There are several offside England players hampering view and movement but the Australians look well prepared. The referee then says 'From what I have seen there isn't enough obstruction to disallow the try'. 'I agree completely' replies the TMO. Law 10 makes no mention of degrees of obstruction. Remember, an offside player must not interfere with play - must not obstruct an opponent. Full Stop! Look at the players marked 1, 2, 3. They are equally spaced, moving to their left. 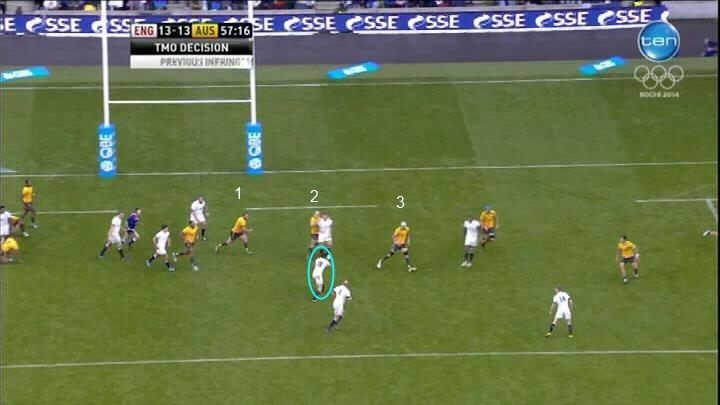 Players 1 and 3 have taken full strides, while player 2 appears to have his path blocked by an offside England player (Dylan Hartley). It does not matter whether or nor he does it intentionally (in the video it appears intentional to me), he is offside and must not obstruct. The image below shows the situation one pace later. Quite clearly Moore (marked as player 2) has been impeded. The players are no longer well placed in defence. Moore(2) has been unable to maintain his position midway between players 1 and 3. The gap between players 2 and 3 is now twice the size of the gap between players 1 and 2. The gap Farrell went through would not have been there had it not been created by an offside England player preventing an Australian player from maintaining his correct position in the defensive line. A huge amount of effort appears to be put into getting players 'innocently' in front of the ball carrier. It should be stamped out. 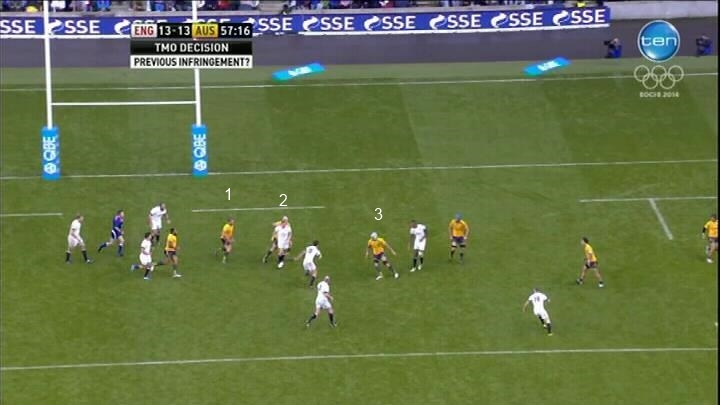 In the image above there are 5 England players in front of the ball carrier (offside) and only two behind! Obstruction!! The try should have been disallowed.